OST converter program is programmed to transfer data from Offline data file to any of the featured output formats. PST, EML (Single Email), and MSG (Single Outlook Message) are the supported output file types. The tool is capable of converting data from a damaged OST file. OST file convert tool ensures the thorough scanning of the data file to ensure that it is convertible. Preview of the same is provided before conversion. The users are provided with an option to decrypt the emails of the OST file which are encrypted using OpenPGP and S/MIME encryption. The "Remove Encryption" checkbox should be enabled to use this feature. There is one search feature offered in the OST Converter which provides option to search OST file in the selected drive or from all the drives available on the user system. Conversion of OST file is doable with selective items only. Users can define a date range based on their requirement and only export the desired set of data from OST file for conversion into the chosen output format. 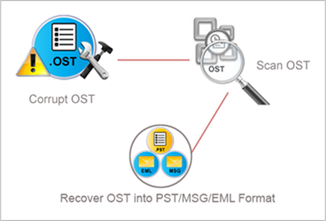 OST convert to PST tool offers options to customize the data export. On choosing PST for conversion, you can split the output while selecting MSG or EML will enable the option to apply chosen naming pattern for the output. The need of converting an offline data file comes up in scenarios where the users are unavailable with the right environment to read the OST. An OST file is designed in a way that it can only be accessed / opened / read in its origin environment owing to the fact that it is bound to its source mailbox on Exchange Server. Therefore, it is impossible to carry around this file and attain mobility or synchronize it with the server in downtime conditions. 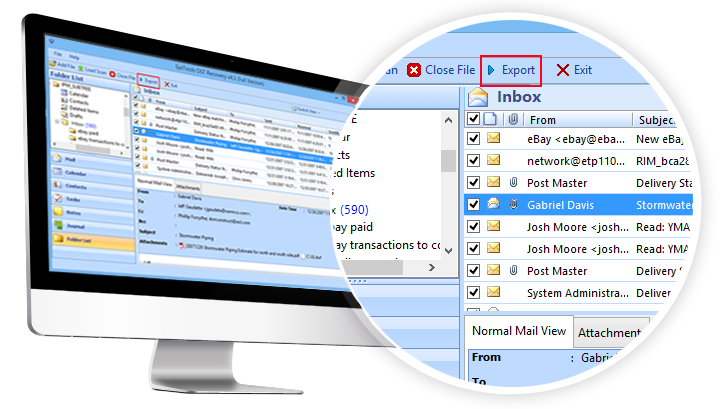 Nevertheless, conversion of OST file to Outlook PST format not only makes it available at all times but also accessible without server dependency. This can be done by the mere implementation of Outlook only then why go for a tool, right. Wrong, OST converter tool is not just meant for the conversion of OST files but is also programmed to successfully convert Offline data files even when they are corrupt/orphan that is something you cannot do manually. Freeware Trial for Product Testing - It is feasible to test the product before you decide to invest on it. Outlook OST file converter tool is available as a freeware trial edition that can be used for testing the OST convert in PST process. However, you can only preview the data as part of the demo limitation. Time to Go For A Purchase! - Once you are satisfied with the ability of the software and want to OST convert into multiple file formats you can go for the purchase of licensed version. There are multiple licenses available for purchase that can be chosen according to the requirement. Our primary requirement was not to just convert OST file but to make sure the data is extracted as the file was partially damaged. Thankfully, the application outlook ost file converter is perfectly programmed to deal with the issue. I am totally satisfied with the experience. Having OST files that too without its environment is next to having nothing. We cannot do anything with it, can we? So I decided creating a PST out of it and the OST Converter tool sure did help greatly in doing the same with its perfect functioning.